Senior enlisted leaders place a wreath at the Tomb of the Unknowns at Arlington National Cemetery, Va., May 20, 2017, in honor of Armed Forces Day. 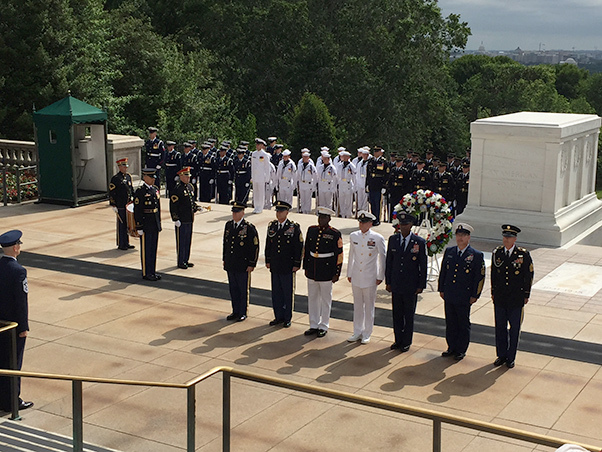 The senior enlisted leaders of the Defense Department and the Coast Guard placed a wreath at the Tomb of the Unknowns at Arlington National Cemetery May 20 to mark Armed Forces Day. Army Command Sgt. Maj. John W. Troxell, the senior enlisted advisor to the chairman of the Joint Chiefs of Staff; Sgt. Maj. of the Marine Corps Ronald L. Green, Chief Master Sgt. of the Air Force Kaleth O. Wright, Master Chief Petty Officer of the Navy Steven S. Giordano, Master Chief Petty Officer of the Coast Guard Steven W. Cantrell and Sgt. 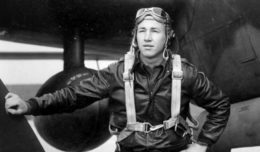 Maj. Don Rose, representing the Sgt. Maj. of the Army Daniel A. Dailey, participated in the ceremony. The service senior enlisted leaders placed the seal of their service on the wreath, and Troxell, as the senior enlisted leader in the joint force, placed the wreath at the tomb. It was an all enlisted ceremony, too. An Army command sergeant major was the commander of troops, a sergeant major conducted The U.S. Army Band in the national anthem, and each of the services’ honor guards were commanded by noncommissioned officers or petty officers. “It’s our way of marking Armed Forces Day and beginning the commemoration of Memorial Day,” Troxell said after the ceremony. Marine Corps Sgt. Maj. Bryan Battaglia, Troxell’s predecessor, began the tradition. The fact that it was an all-enlisted review is nothing new to Troxell. “This is what we do as an empowered enlisted force: we operate under commanders’ intent to do the mission,” Troxell said. “NCOs do this every day around the world. Having my battle buddies out there with me is huge in showing the importance of the enlisted force,” he added. Master Chief Petty Officer of the Coast Guard Steven W. Cantrell meets a Korean War veteran from Midland, Texas, at the Memorial Amphitheater in Arlington National Cemetery, Va., May 20, 2017. After the ceremony, the enlisted leaders visited the tomb guard quarters underneath the Memorial Amphitheater. Tomb guards and tomb guards in training gave them a tour of the facility and told the enlisted leaders about their training and their motivation. The senior enlisted leaders then went back to the tomb to watch the changing of the guard, presided over by Army Staff Sgt. Ruth Hanks of the 3rd Infantry Regiment , The Old Guard. 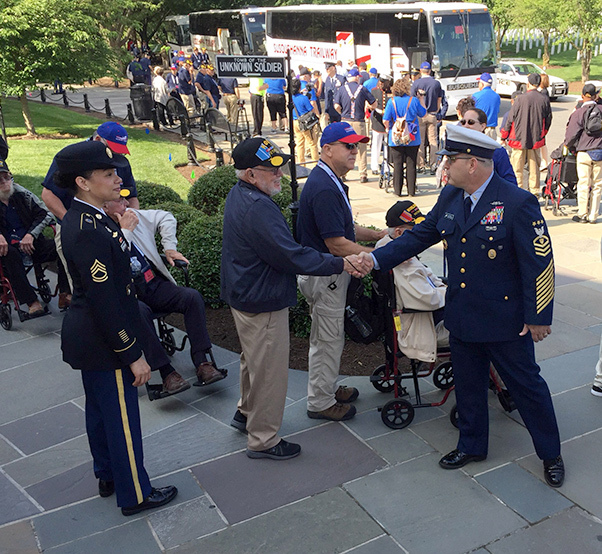 As the senior enlisted leaders arrived for the ceremony, they serendipitously met veterans from an Honor Flight from Midland, Texas. The veterans were from World War II, Korea, Vietnam and Desert Storm, and Iraq and Afghanistan vets were helping their older compatriots. Two of the veterans charged ashore at Normandy, France, on D-Day, June 6, 1944.